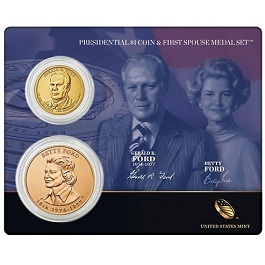 The Gerald Ford Presidential $1 Coin and First Spouse Medal Set debuted last week. The U.S. Mint’s weekly sales numbers have been released, giving us our first look at statistics for a number of new products. Perhaps the most interesting revelation comes from the sales total for the 2016 American Eagle Gold One-Ounce Uncirculated Coin, which debuted on Thursday, April 7. As noted on Mint News Blog, Uncirculated Gold Eagles tend to have significantly lower mintages than their Proof counterparts. But considering the high demand we’ve seen for the 2016 Proof AGE‘s and Gold Buffaloes so far this year, it seemed possible that the new Uncirculated issue would see a bump in sales, if only a modest one, and that’s exactly what happened. The 2016 AGE Uncirculated coin sold 2,968 units during its first week of availability, more than any previous issue in the series since Coin Update began posting sales reports near the end of 2009. Last year’s issue sold 2,157 pieces in its first week, the 2014 coin sold 1,844, and the 2013 coin posted 1,448. Also making its debut was the Gerald R. Ford Presidential $1 Coin and First Spouse Medal Set, which sold 1,702 units. As a point of comparison, last month’s Nixon coin and medal set sold 2,095 units during its first week. Cumberland Gap quarter products launched as well; the two-roll set and three-roll set were the second- and third-highest selling products of the week at 6,774 and 6,448 units sold, respectively. The number one seller for the Mint this week was the 2016 U.S. Mint Proof Set, which sold 26,415 units. The following statistics show total sales for the listed items through April 10, 2016. The first numerical column includes information from the Mint’s April 3 report, the second column displays this week’s updated numbers, and the third column tallies the increase in sales over the last week. Items new to the report are listed in bold. For more information on any of these products, please visit the U.S. Mint’s online product catalog.